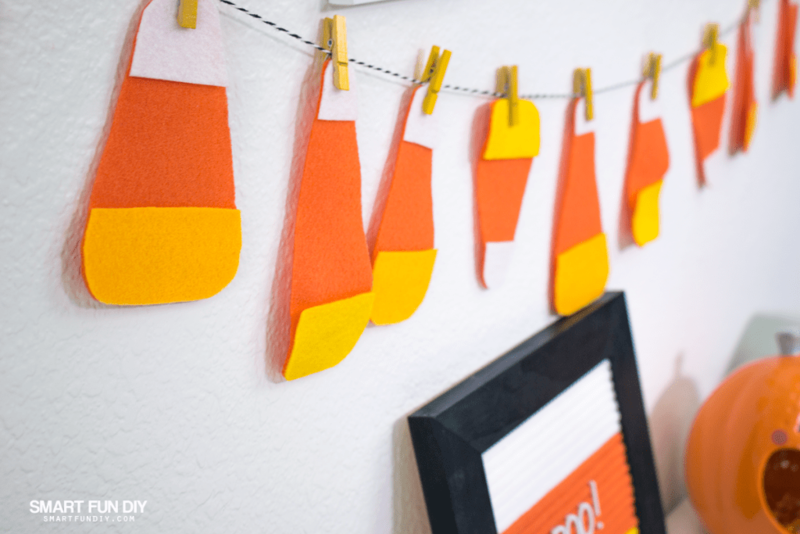 Do you absolutely love candy corn and all things Halloween? I love decorating my house and even my desk area for the holidays. 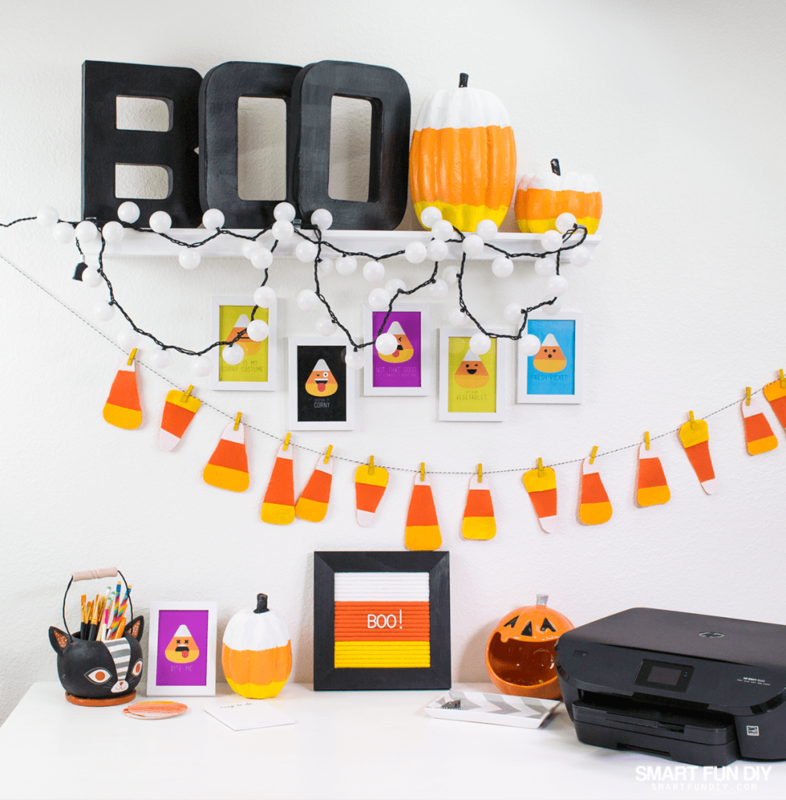 I'm going to share with you some really fun easy tips for decorating your office area for Halloween. You don't have to just leave the decor at home. This post contains affiliate links – when you click and purchase from these links, the seller gives us a small commission that helps keep the lattes flowing so we can bring you more Smart Fun DIY ideas like this! Thank you for your support. 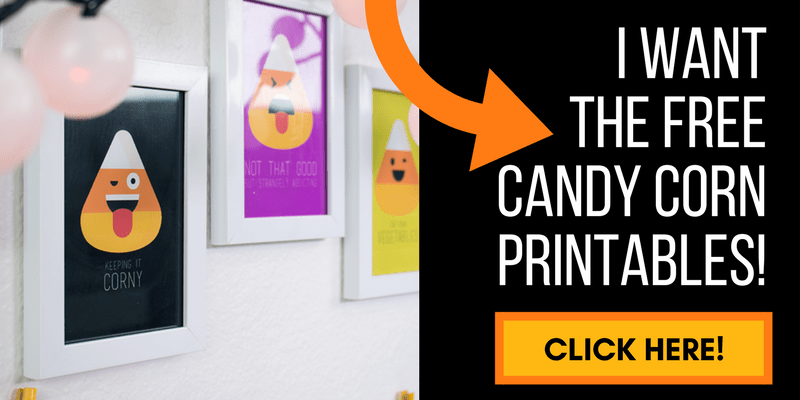 Before we get started, make sure you grab the free printable with eight different corny designs here: CLICK HERE! 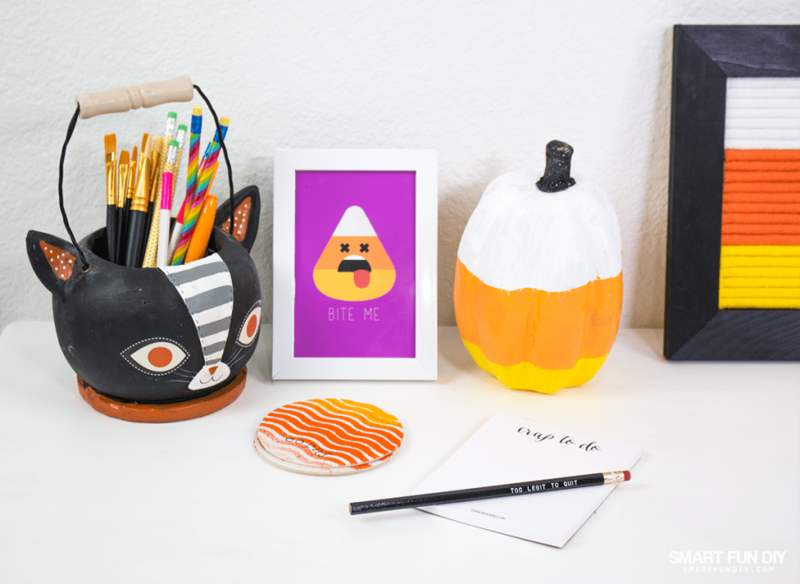 The secret to fun Halloween desk decor is easier than you think! Decorating for Halloween is way easier than you might think! I have a really simple formula that you can follow to make your space look absolutely amazing for the Halloween season. The first step is to dress up your wall space. 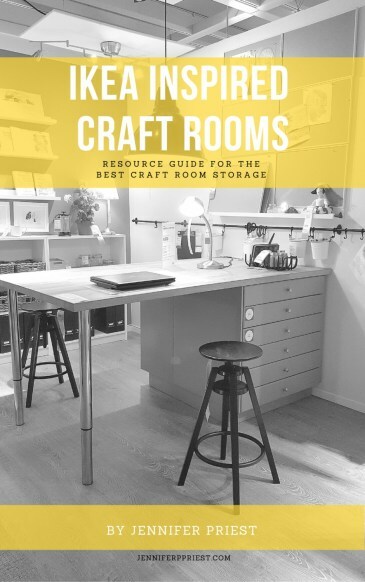 If you have a cubicle you're going to have a little bit less wall space to work with but if you have an office, there's a lot of great space you have to work with. 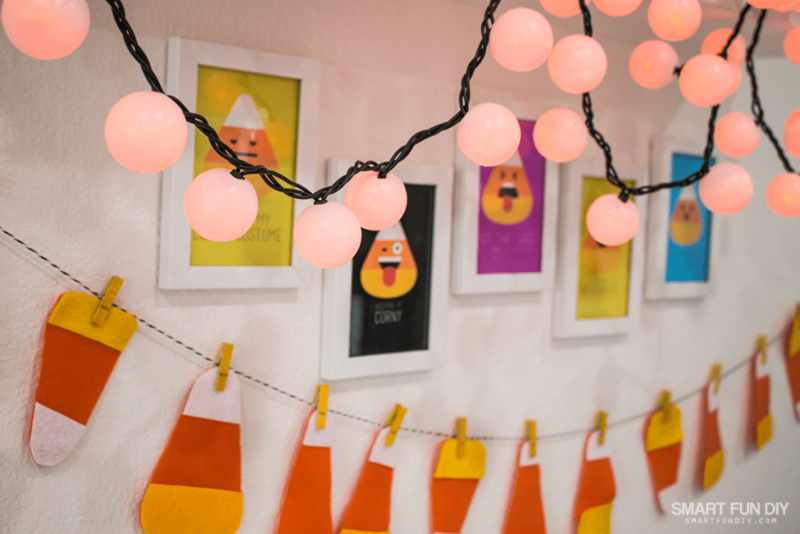 You can decorate the back of your door or a wall in your office with a banner or cute string lights. I'll show you how to do a banner later on in this post that super adorable and really easy with affordable felt. You can get a soft glow from your regular average Christmas string lights by using ping pong balls. Something about holiday lights always makes everything feel extra festive. You don't have to be super fancy with the decor to have a high impact. There's tons of amazing adorable free Halloween printables available online. 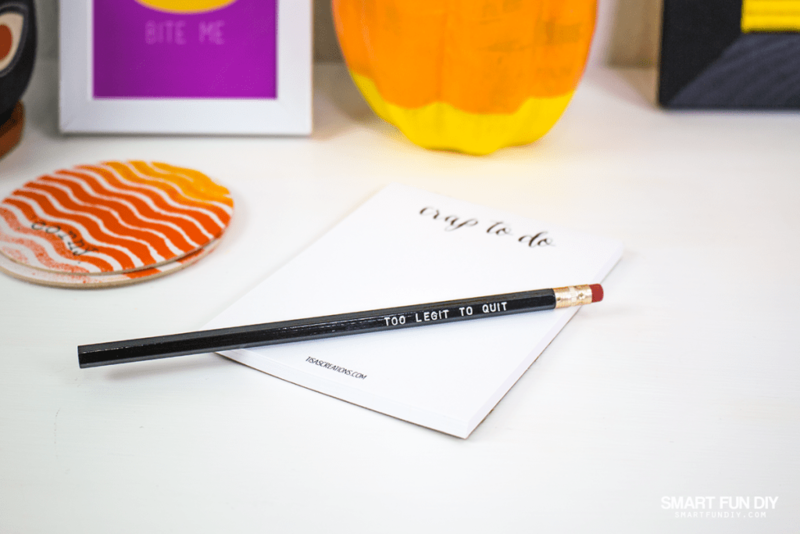 In fact, I'm sharing some free printables in this post! Make sure that you scroll down and grab those from the big button down at the bottom of this post. See lots of great free printables not just for Halloween but for every single holiday that I've collected on this Pinterest board. 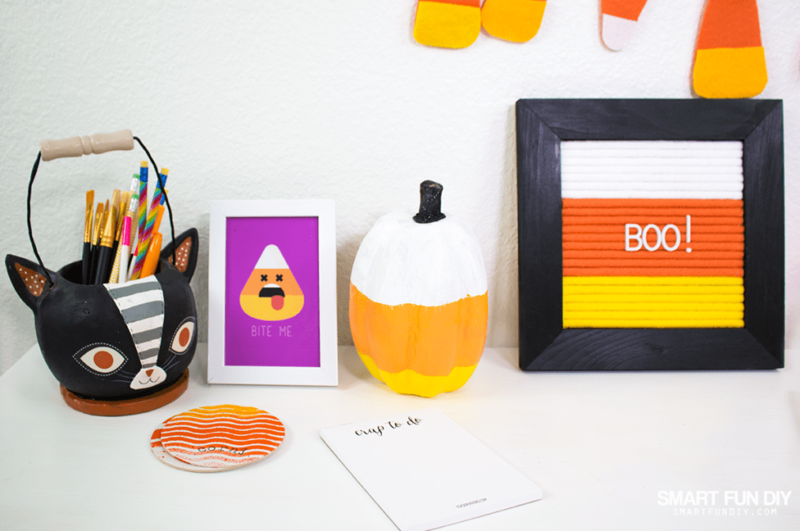 You can decorate your desk with cute items that you either buy from the store or hand-make. 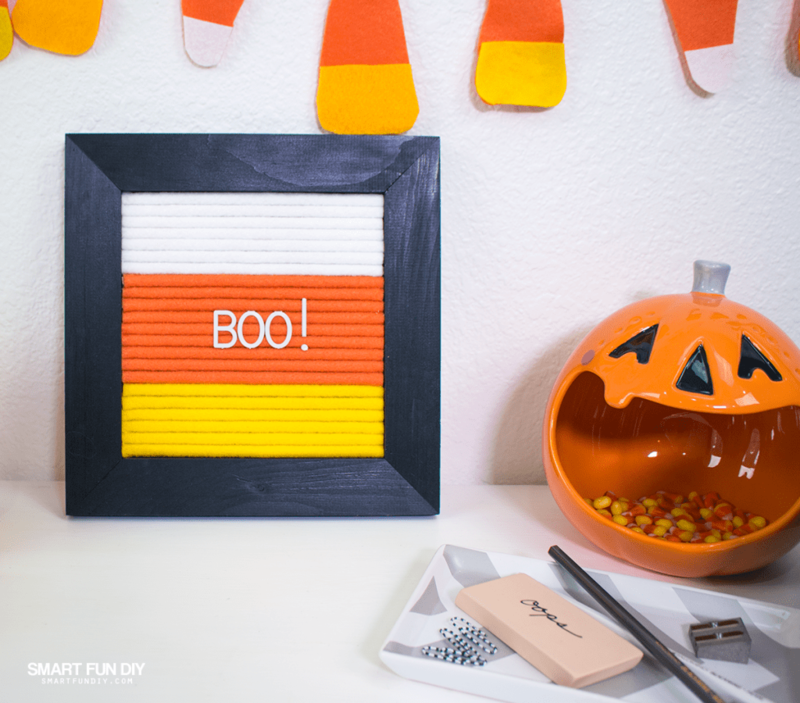 I'm going to show you how to make these really cute candy corn inspired coasters, framed art and candy corn pumpkins. You can use handmade items to round out the look and complement your store-bought items. I got this really fun pumpkin candy dish a couple of years ago. Plus if you're working in an office, people love to stop by and grab a little bit of candy if you've got a nice welcoming candy dish on your desk. 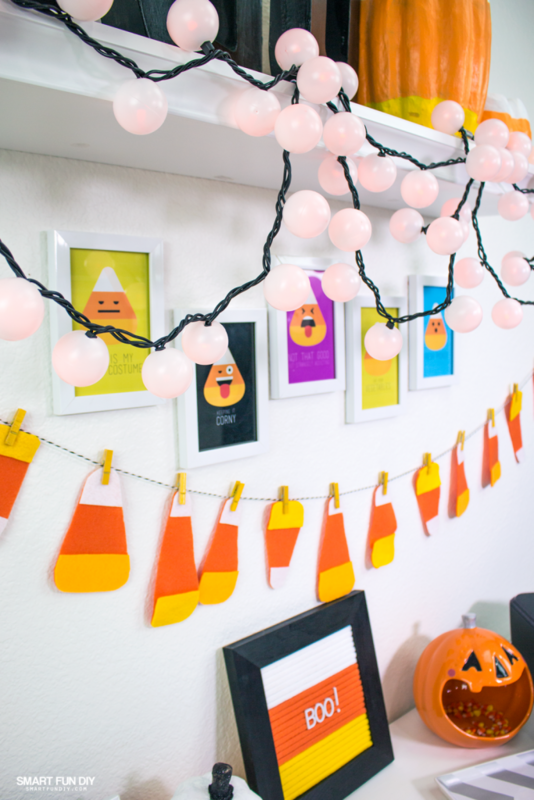 This DIY candy corn banner is super crazy easy, really adorable, and super affordable. These sheets of felt are easy to find at the craft store for about $0.25 a piece. I'm also using Presto felt which is the self-adhesive felt from Kunin, the same company that makes the eco-fi recycled plastic felt that we all know and love. You don't need to spend a lot to have art that looks great for any holiday. Grab some Dollar Store picture frames to start. You can make these look better by spray painting them or even decoupaging over the dollar store frame finish. To give your printables a fancier, more finished look, you can print them onto photo paper or HP brochure paper. I used brochure paper because it helps the colors really really pop but it still thin like a regular printer paper. 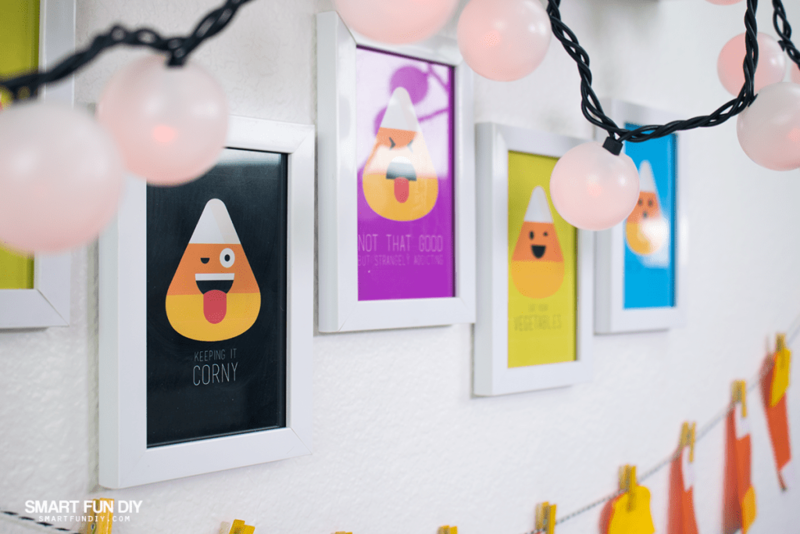 Make sure you grab the free printable with eight different corny designs here: CLICK HERE! I got these really super cute plain coasters from my friend Tisa in her Etsy Shop and then dressed them up for Halloween with ink. What's great about plain coasters is that you can buy a big pack of them and then customize them to whatever holiday decor or even a party that you're having. To make these coasters I used a mix of stencils, some spray ink and some miniature letter stamps. You can grab letter stamps like the ones I used in the dollar spot at Michaels and at Target. To make these patterned coasters, lay the blank coasters in the spray booth. Lay a stencil on top of each coaster. Then spray the two colors of ink over top, allowing them to blend. Remove the stencil immediately. Allow the ink on the coasters to dry. Stamp sassy sayings with the letter stamps and black archival ink. The Coasters will be ready to use right away. You can also pick up these really fun sassy Halloween notebooks in the Tisa's Creations Etsy Shop. I added googly eyes to mine with some glue dots. 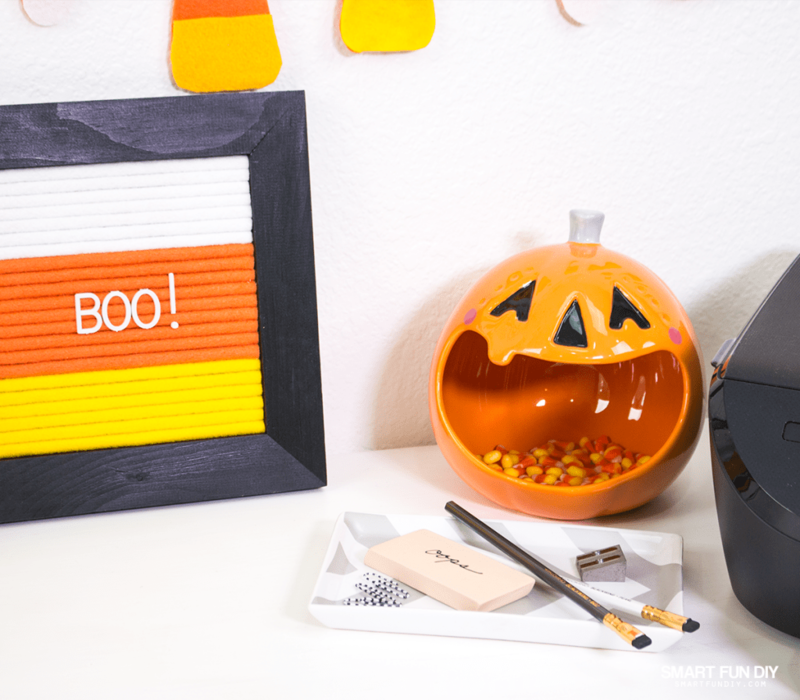 I hope that you enjoyed these fun candy corn desk decor ideas. 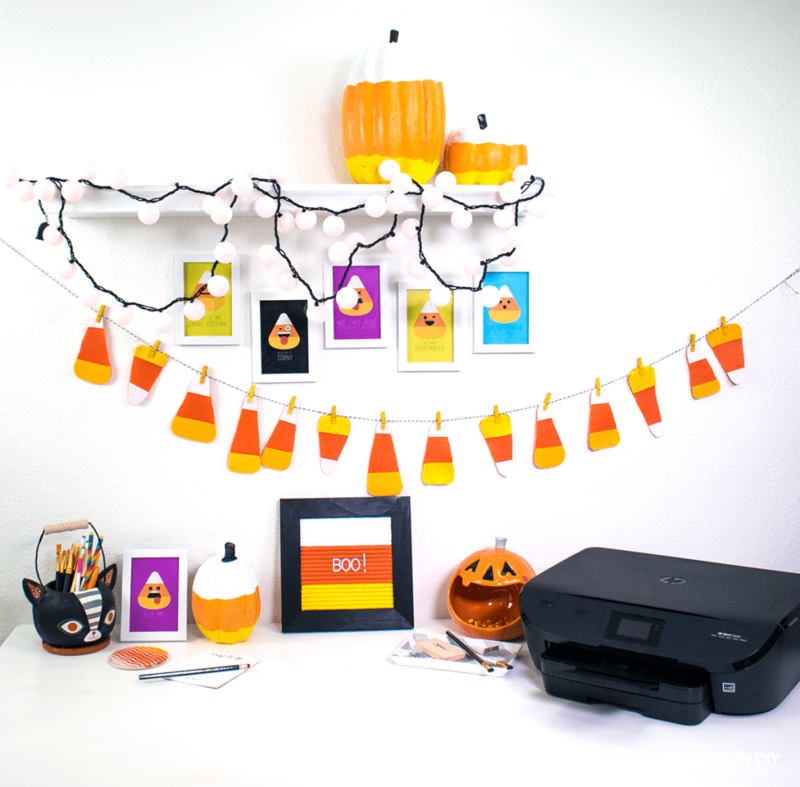 How are you going to decorate your work area for Halloween this year? I'd love it if you shared down in the comments! I love your “Corny” candy! Cute and easy. Thanks, I didn’t know about the eco-fi plastic felt! Perfect printables!!! Love all the candy corn! So cute! I’ll be featuring this tonight at Merry Monday. Hope to see you at the party!